The other day I ran across a video posted on social media: A man wearing a backpack stood in the middle of a valley flanked by snow-capped mountains. Animated clips flashed on the screen, emphasizing his impassioned plea to live your dream—your purpose—now. He talked about how people on their death beds are less likely to regret the things they did in life as opposed to those they didn’t. No right way. There is no magic formula for getting from point A to point B. Your mantra might be ‘trial and error’ or ‘go with the flow.’ Modify as needed. Quit comparing. Joseph Campbell writes: “The privilege of a lifetime is being who you are.” You’ve heard the saying: Life would be boring if everyone was the same. Now live like you believe it. Life doesn’t stop. Stuff happens. Appliances break down, illness and injuries occur and sometimes bad news arrives in threes. Do what needs to be done and then see #1. Change of scenery. At times it may be necessary to step out of your comfort zone in order to follow your dreams. This might include changing a routine or your surroundings. Be open to the possibilities. Have fun. Oscar Wilde writes: “Life is too short to be taken seriously.” Laughter provides a balm to the soul and lightens the load. Lift the corners of your lips often. Refuse to fear. Jack Canfield says: “Everything you want is on the other side of fear.” If fears are stories you tell yourself, then change your story. Remove distractions. Shut down when necessary; i.e., disengage from social media, email, etc. The world will not stop when you go off the grid to pursue your passion. Prioritize. Each day tackle the easiest, fastest tasks first. Then dive into your pursuit and camp out there as long as it takes. The piles of dirty laundry aren’t going anywhere. Delegate, ask for help. It’s okay to say ‘no,’ or to pass the buck, in order to create space to chase your passion, which is the one thing no one else can do for you. The narrator in the video closes by illustrating how a plane is less safe when on the ground because it’s prone to rust and deterioration. When you don’t live your dream—your purpose—you clip your wings and ultimately remain grounded, much like that plane. Mired in regret. But when you put wings on your passion, you begin to take flight. What’s your advice to avoid the ‘could’ve, would’ve, should’ve’ mentality? Image courtesy of Stuart Miles at FreeDigitalPhotos.net. I start out wanting to write a Blog Post for Superstition Review. I want to make it funny. Knowledgeable. Relate-able. The reader should laugh and think “I would like to talk with this writer.” All great writing is getting people to think they know you, that they would want to talk with you. But I have no idea what to write about. I just graduated from college and that is about as boring and overdone a topic as any. I might as well write about golfing, or about the time I played flag football at a local park and discovered I am not the sort of person who should be playing flag football at a local park. I like to write, but have written nothing of tremendous value. That isn’t fishing for compliments, just speaking objectively. Therefore I can’t offer advice to writers, though I have in the past done this very thing and, to this day, I still feel guilty about it. My writing is not terrible and has made some money in academic contests but I know, what everyone knows, but no one likes to say, that undergrad academic contests aren’t worth anything except the prize money. So I can’t write about being a professional writer, because I am not a professional writer. I’ve had great experiences through my time as a Blogger/Non-Fiction Editor/Student Editor in Chief at Superstition Review, but others, in ways I cannot top, have written about those very experiences for this very Blog. Others, in ways I have yet to mimic, have taken those experiences and grown because of them. I have been to a writing conference but already have, in a previous post, beaten that horse to death with a very small club. I have been to AWP but spent more time touring the city than touring the Book Fair (shameful, I know, but who could have guessed I was to fall in love with cold beautiful grey Minneapolis?). Bloggers tell you to write what you know, to relate to your audience through what you know. Good with dogs? Write about dogs. Write about how finishing a short story is similar to teaching a new puppy how to piss outside. It’s all about consistency. Go on a lot of hikes? Write something about the writing process and compare it to hiking a new trail, a harder trail than usual. It’s all about persistence. But my dog still sometimes pees on the living room rug, and the last trail I hiked ended with a whimper, not a bang. I thought maybe I could write about how to make the world’s best macaroni and cheese, but then I remembered, halfway through that ill fated blog post, that the best mac and cheese I ever had was made by a girl named Beth one drunken night six years ago at a friend’s house where we were all drinking wine out of plastic red cups and that recipe, like my connection to Beth, was completely lost after that night. Telling me to write about what I know has always been a sort of cruel task; because I want to write about what I don’t know, and about that which makes me question my sense of authority. I am reminded of a writing professor who, in a soft rant against ‘trigger warnings’, asked our small workshop circle “Isn’t getting triggered the point?” For me, it goes like this: isn’t admitting you don’t know the point? Here’s what I don’t know: the value of writing and whether or not I am a writer. I have loved books from a young age and can point to moments in my life that were shaped directly by the works of Salinger (specifically his collection of short stories revolving around the Glass family), to Tolstoy’s War and Peace (one of the first books that genuinely made me want to be a better person) to Dubliners by James Joyce which made me first think about becoming a writer. There are more recent examples, as well. In Matt Bell’s Scrapper there is a scene, where our protagonist finds a stolen boy and the snow is falling overhead, and where I, the reader, was so completely transported into that scene that my heart skipped a beat. But the more I work on Social Media for my job, the more I interact with other readers, with other writers, the more new books and new styles of writing I read, the more the doubt inside me grows. As valuable as stories have been to me, how can we properly value them? There have been blog posts in the past about how writers should be paid, for their stories, their poems, and that magazines shouldn’t expect writers to be content with just getting published. But can we really make that case? I would argue the opposite. That now in this sea of media, where everyone, through so many mediums, has the ability to share their voice, the value in stories is dropping or, at the very least, leveling off in an over saturated market. This makes me doubt my writing. Do I really just want to be another voice in the market? Is there anything I can say that someone couldn’t say better? I honestly don’t know. That’s why I wanted to write this blog post, because I have no idea. What I see, through Social Media, are countless writers celebrating the fact that they are just writing. And this gets me a little depressed. It isn’t enough that we are just writing. It isn’t enough that we can take photos of our notebooks next to coffee cups and filter the image to look antique and post it. Perhaps this is the result of working in a book store and seeing just how many books get published and how few new writers actually get read. It isn’t enough that you have a story to tell. But now I am giving advice to writers, which is something I already said I wasn’t going to do. So let me stop while I am ahead. I think it’s safe to say I’ve fallen out of love with writing. Like any great relationship, falling out of love makes me think of our earliest moments. I remember the first real Creative Writing class I had, where the teacher wrote the words “blue boot” on the whiteboard and asked us, rhetorically, what we were thinking of in that moment. Of course the answer was: a blue boot. Wow, the teacher said quietly, isn’t that amazing? Just by putting two words together, an image was created in our mind. What if, instead of a boot, we did that with a town? Instead a town, a world? Instead of a world, an emotion? What if, through words, we could create the idea of love, of loss, of fear, inside our reader? Wow, all of us students quietly said to ourselves. This is all to say I still love reading good work. There were two writers I met at Bread Loaf whose writing I loved. One of them had already published a book and I read it in a matter of days. The other one hadn’t published a novel yet, but was certainly almost finished with their first draft. I look up their names every now and then in the usual places. Linkedin. Twitter. Instagram. They aren’t there. They don’t exist on Social Media and this makes me so goddamn happy. Now I can tell myself that, wherever they are, they are focusing on their work. Nothing else. And that one day soon their next book, their next story, their next finished product is going to be put out into the world, and whatever they have created with their words will be stirred within me. 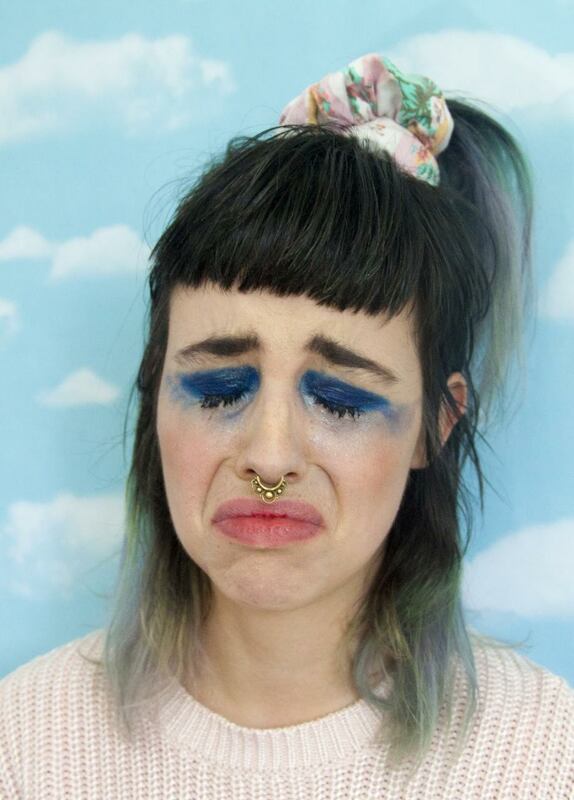 Under her pseudonym, internet artist and social media star Molly Soda has made her portfolio off the pitfalls of social media and the new generation of Internetisms. She set aside some time to talk to our Art Editor, Regan Henley about some of her work and her perspective as a web artist in the spotlight. Regan Henley: One of the things I find most interesting about your work is your examination of internet fame, which of course, is a relatively new invention. I particularly like “Inbox Full.” Did you set out to examine these concepts, or do you think they are more just a product of your situation? Molly Soda: I never put myself or my work online with the intention of becoming “famous” or with any attempts to amass a large following. I’m interested as to why certain personalities gain such followings–why do I choose to follow who I follow online? What makes someone appealing? “Inbox Full” was definitely a product of my situation. At the height of my Tumblr “fame,” I began to notice major changes in the way people would interact with me online. The Tumblr “Ask” button sort of allowed this influx of anonymous communication–anyone can contact you, and anyone can tell you what they think of you. And all anyone wants to see–when they send someone a message, especially something negative–is a public reaction or response. I had thousands of messages in my inbox, both positive and negative. It was a way to acknowledge everyone as well as a way to purge and sort of wipe that digital slate clean. RH: A lot of your press and presence in the art world seems intrinsically tied to your social media persona. Did you find that to be a help or a hindrance? MS: The Internet has gotten me further than going to art school ever has. RH: Ha. You’ve addressed the unique aspect of tween girl friendships in the context of new technology, like your “Tween Dreams” and sleepover videos. How do these stack up to your own adolescent experiences? MS: “Tween Dreams” is very much based off of my actual adolescent experiences. I set out to make something more realistic with that series–something that reflected the reality of being a tween more so than the stuff I watched (and hoped for) when I was a tween. Also, something that actually looks like it would be made by a tween. It was important to me to put less focus on crushes, boys, not liking other girls and more focus on female friendships. RH: How do you think these tween experiences changed/are changing with technology? MS: I’m sure the tween experience is completely different from when I was growing up. What’s the equivalent to AIM now? That’s how I communicated with everyone after school… how I got my first boyfriends, etc. Does everyone just text? Facebook, Twitter, Tumblr and Instagram didn’t exist… I don’t even think MySpace was a thing yet? Smart phones weren’t a thing. I got my first cell phone at 14. The list goes on. I only used to the Internet to take online quizzes, talk to my friends on AIM and play Neopets. It’s vastly different! I’m sure the social codes for how to interact online with each other have changed as well because there is such an influx of new technology and rapid communication. [It] would be interesting to dig deeper–[I] feel like now that I’m not a tween, I’ll never fully comprehend it. RH: You’ve incorporated a lot of occult elements in your work, particularly with the creation of your colorful and idyllic digital spell book. How do these practices fit into your work? MS: I’m not a witch by any means. The Spell Book was sort of a way for me to try and incorporate our digital lives into our spiritual lives. Because the digital is so present and so fluid, it makes sense to want to reach some sort of clarity through our screens. I’m always thinking of ways to virtually cleanse myself–there’s a lot of clutter and stress that happens online that isn’t really talked about–perhaps because it doesn’t feel as palpable. RH: Your work has a very early Internet, 2000s vibe to it at times, can you speak a bit more to that? MS: This is mostly a product of what I grew up with. There’s something comforting in the glitter graphic. There’s something mildly liberating and chaotic about design sensibilities from the early 2000s. Everything now is a bit streamlined, you can only customize your user profiles so much–it can feel stifling, and I like to get away from that in my work. RH: A lot of your work directly confronts social media sharing, and you’ve gone out of your way to post images of yourself that many may be more hesitant to share online. For example, your “Should I send this” nudes or any “less than flattering” images of yourself. Would you say your work comments more on a new culture of over-sharing or more on over-produced, highly-selective sharing? MS: Just because I’m “over-sharing” and posting unflattering photos of myself does not mean I’m not curating my image to a certain degree. We all are. There’s no shame in that. For every selfie I take, there are at least 10 that didn’t “work” for me. I’m no more “real” than anyone who retouches their photos. RH: When making these pieces, do you ever delete something you’ve put up? MS: I generally don’t delete anything I post. It’s all up there, as embarrassing as some things may be. Owning up to embarrassment or shame is the best way to work past it. RH: What’s your big dream for your art as of late? If someone gave you a huge grant what would you do with it? MS: There are a lot of pieces I want to make that can’t be realized because of financial limitations. My dream is to ultimately be able to make the work I want to make and live comfortably off of it. It’s not a “big” dream, but it often feels impossible because of how money is displaced in this world–artists put so much work in and are expected to do it for free constantly. If I were to receive a huge sum of money, I’d put it into public spaces. I want to make work that can be inhabited IRL as well as online outside of a gallery. I’m interested in parks and would like to eventually do a piece where I create my own fantasy park that people can visit. RH: What have you read, recently or not so recently, that has inspired your work? MS: I misread a sign that said “no cycling,” and I thought it said “no crying.” That one’s stuck with me for the past few months. RH: Where can we find you these days? I’m going to be honest with you: I hate blog posts that tell people how to get published faster, how best to submit or write cover letters. More accurately: I hate the number of them. I understand that the process of submitting to journals can seem daunting to a newcomer, but I see more social media sharing of posts that offer submission tips (and submission “strategy”) than those that offer writing tips, which seems backwards to me, and beside the point of what would hopefully be an artistic endeavor. Furthering my frustration is that many of these articles make cover letters, and the submission process as a whole, seem like an intricate, mysterious process. Truthfully, it’s not. And I fear that all the attention and worry about the logistics of submitting, namely the cover letters which seem to give those new to the process the most trouble, is distracting. As an editor, let me tell you: I believe a lot of people are over-thinking this. Because the reality is: we’re spending a lot of time talking about what hardly matters today. That, essentially, is it. Sure, all editors have pet peeves, but those are minor, and for any editor who gives a crap (which, since most editorships are purely a labor of love and not paying gigs—even then, paying very little—is essentially all of them) it will always come down to the quality of the writing itself. Those annoyances (more on those later), while worth being wary of, in the end don’t matter. Only a lack of one of the two things listed above would actually impact the way I read a submitter’s work. Of course, if there are any specific instructions with regards to cover letters in the guidelines, like specifically asking for you to include or omit a bio (generally you would include one if not specified), make sure you follow them. But usually there are not, and the presence of a cover letter of some kind is simply implied, which I think is where a lot of the confusion can come from. So having a sense of what a typical cover letter should do might not be second nature to newcomers, but it’s hardly complicated once you’ve been on the editorial side and read a few directed at you. Cover letters, remember, came from a time when submissions (and job résumés, for that matter) had to be mailed in physically. A writer would have to type out a cordial hello to editors on a typewriter, insert the letter and the submission into an appropriately-sized envelope, affix postage, then, I assume, ride their donkey to the nearest township and hand over the parcel to the Post for the next time a train came through town (again, this is based on my assumption—kind of before my time, submission-wise. My foray into publishing didn’t start until the late 00’s). The cover letter was necessary because for an editor, receiving an envelope that is a product of a fair amount of effort already and opening it to find nothing but the work to be considered—the effort stopping short of the formal hello and thank you—would come off as impolite and impersonal. Today, however, nearly all submissions are handled online. While this has made the process far less cumbersome, it also means a few things have changed about the act of submitting and considering work for publication, for both writers and editors. For one, it makes the ability to submit one’s work faster, easier, all around more accessible for people to start sending out their work. Therefore, submissions are far more numerous. Editors are inundated with submissions, plenty of it high-enough quality to put together stellar issues of course, but still many to read and consider. That means more cover letters to read, which many writers hate writing anyway—so for both sides a shorter letter becomes preferred. Which is not say that you shouldn’t pay attention to this part of the social contract between writer and editor, but rather that it’s not something worth troubling yourself over past the few moments it takes to do it right. So, even though I railed against this exact thing up front, allow me to explain why those two points above (taking the publication and your own work seriously), are all that matters to me in regards to cover letters. When in doubt, it’s best to keep a cover letter short and cordial. If it’s your style, you can be witty, enthusiastic, and more in your cover letter—I like seeing the writer’s personality outside of the work!—but please, don’t do so at the expense of your own writing. I received one submission whose author told me the poems within were written in a period of severe dietary distress—not exactly the association you want to build as I move on to your poems. Some cover letters preface the work with something along the lines of “These probably aren’t very good.” This, to me, is baffling; if you, the person who spent time and effort to build these works of art, don’t think they’re of any quality, why should anyone else? And if you truly think sending them out is a waste of time, why would you then knowingly waste the time of an editor? Some of this language may come from an attempt at appearing modest, but direct communication with an editor is not the place for that. Neither is arrogance, mind you—that’s actually far worse—but all that matters is that you believe in your work, and think it’s worth an editor’s time and consideration. “Cute” bios. I don’t care about your pets’ names. Yes, I’ll enjoy all the pet photos and videos shared with me on social media, as everyone enjoys them, and I’m sure your animals are lovable and adorable, but unless your poems were written while under a hypnotic spell put on you by your Jack Russell Terrier, Juno, leave the pets out of the bio. I’ve seen some humor tucked into the final line of some bios, and sometimes they are amusing while still fitting into the main two points of criteria above, but more often than not they come off as unprofessional or at least distracting. Also worth remembering is that these bios will often be pared down by editors if your work is accepted anyway. Don’t explain your work in your cover letter. To wit, I’m not further explaining this bullet point. Read. The. Guidelines. Some editors will not consider a submission from someone who clearly couldn’t be bothered to take 60 seconds to read the guidelines for submitting (yet again, not showing respect for the journal that one is asking to spend well more than that amount of time reviewing one’s work)—as is their right. Personally, I’m not in that camp because I want to find the best possible poetry I can, no matter what, but clear disregard for the very reasonable guidelines given (as they always are, no matter the journal) will not be setting one up for success. Your work will have to shine bright to make an editor forget the fact that you couldn’t be bothered to follow their instruction. It certainly does happen, but if you want to help your chances, take the time to be considerate. Bios that state number of publications. “FirstName LastName has been published in over 200 journals.” Hm. I don’t doubt that claims like this are true (though like hell am I going to count to verify), but it says something about a writer’s priorities, implying that one cares more about publication than creating good work; quantity over quality. List a handful of relatively recent publications you’re proud of, and leave it at that. If you have a book or multiple out, you probably don’t need to list more than those. Notably, I get the sense that someone who’s published in 200, 300 (I even saw one submission that claimed over 1000) journals is just sending the same batch or two of poems indiscriminately to as many journals as they can. Are you sure you followed the guidelines? Never hurts to double check. Address the submission to the proper editor(s). 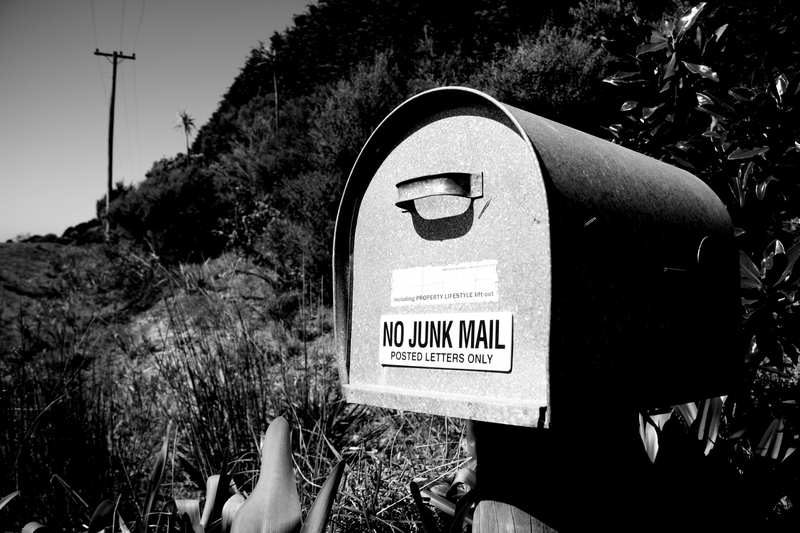 For example, if you’re sending fiction, address it to the fiction editor(s) by name. If there are no dedicated fiction editors for whatever reason, addressing it to the editor, managing editor, or editor-in-chief is your best bet. In rare occasions a journal might have more than a couple editors for a given genre, in which case “Fiction Editors” or “Poetry Editors” is an acceptable substitute to listing six or seven names out. Worth keeping in mind is that unless submissions are read blind, these are the very first words read in your submission and to get them wrong (like saying “Dear Editor” when there are multiple editors in your genre, or getting the gender of the editor wrong—I’ve seen it) is not a good first impression. Editors want to read your work, and if it fits what they’re looking for, they’ll want to publish it. Submissions are the lifeblood of many journals, and certainly the one I work with. Cover letters are usually necessary, but there is rarely a need to make them more than a friendly, professional hello. Don’t trouble yourself more than you need to with this. Check the box and move on to the work—it’s what both writers and editors care about most. In January of this year, I received an email from the professional social media site LinkedIn telling me my profile was in the top 10% of all viewed profiles in 2012. What surprised me most about this email is that I really had no idea how that happened, or what it really meant. As a writer, book critic, dance critic, ballet teacher (retired dancer), literary podcaster, journal founder, former marketing professional, and rheumatoid arthritis advocate—among other things—I felt like my profile was a jumble of stuff. But what a friend explained to me was that my profile told a story. She went on to say that my story, as told by LinkedIn, defied the one-dimensional logic of the resume, and that my on-again off-again participation in a few very focused professional groups on the site continued a narrative that located me in a community. Before we get to that, there are a few things you need to know. 1. First, as I was growing up, my father worked for IBM. He was a top salesperson, and then recruited into the highly selective Executive Education program, established by IBM’s founder, Tom Watson. But while working in Executive Education, a new project was developing in the Entry Systems Division, and my father was one of the first 40 people to join this project. People told him it would be his “career ender.” The project he’d been recruited for was called the Personal Computer. 2. As a young person, I trained to be a ballet dancer. Although my career was cut short by the onset of rheumatoid arthritis, I’ve enjoyed the opportunity of performing in what’s called “the corps de ballet” or a ballet company. A ballet company is like a family, and although in popular depictions, the rivalries are often the point of focus, it’s the community of artists coming together that truly defines the dancing experience. In that way, it’s unlike writing, a solitary art, one that I’d find only after my short dancing career passed. 3. During my married life, I’ve owned, with my husband, two houses, both of which have been improved through fairly extensive DYI home upgrades. The cost savings of doing the work ourselves (and by ourselves, I really have to say that my husband did almost all of it himself), we not only increased the value of our home, but we had complete control (for better or worse) of the process of making our home a better, more beautiful dwelling in the way we wanted it to be. All three of these things come together, for me, as an artist looking to make my way through the world. The artist’s path is not easy. As Jim Hart, Director of Southern Methodist University’s Arts Entrepreneurship program said at a conference that posted a YouTube video of his speech, most artists find themselves on the over-saturated path where there are a few traditional, commercially-viable opportunities for which there exists a large audience competition for these resources. This rings true—there are only so many books the big New York publishers take a gamble on compared to the number of novel manuscripts; in the dance world, there were only so many people the ballet companies could absorb, and many dancers talented enough to fill those spots. Rejection is high and even the lucky breaks don’t always amount to making a living, Hart reminds us. Shaped by my experience, I believe a few very specific things. Like my father, sometimes you have to take risks to earn rewards—to think off the beaten path to success. I also believe that there is value in community, which was forged in the corps de ballet. And finally, I believe that some things can be done without the aid of (so-called) experts and professionals, in the DYI fashion, giving us an alternative to the modern consumer culture. The professor and retired entrepreneur Greg Watson defined entrepreneurship as “the creation of value often through the identification of unmet needs or through the identification of opportunities for change.” What, more than art, provides value and opportunities for change? We often consider value in monetary terms. Of course, we all need to cover our expenses for our survival and comfort. But can artistic value be measured in other ways? I think yes, and I think one of the best ways is through community building. In the summer of 2012, I started a fledging project with another writer—a book podcast. We chose a book, read it independently, and then recorded our discussion and posted it on the Internet and through iTunes. SummerBooks has grown from a handful of listeners to thousands of hits in less than a year. I don’t even think it has hit its full potential yet. Marketing has been low-budget—via social media, like that LinkedIn profile I started with, and Twitter. The feedback I’ve received on the podcast, however, suggests that writers and readers were, in fact, looking for community. Presses and authors approach us about reading their newest books; listeners often contact us when they hear us discuss a book and then decide to purchase and read it, too. More than anything, SummerBooks has challenged me to be in dialogue with the community I care about: writers and readers. At its essence, SummerBooks is fueled by a passion for books. It’s two women in West Virginia who are either brave or stupid enough to share in that conversation. Late last year, a former student from teaching English 101 in my graduate school days approached me about starting a literary journal. A recent graduate in poetry from the prestigious MFA at Columbia, this student had spent a few years after the program figuring out what was next. Of course, I agreed to help, not only because I have a terrible time saying “no” to such projects, but because I saw it as an opportunity. Souvenir emerged as a result, a journal not only serving writers, but opening up to other art forms and informed criticism. Nascent as still is, the response by both contributors and readers far exceeds, already, our hopes for the publication. It would be fair to criticize these efforts as not being financially viable; at this point, both ventures create value in ways other than monetary. But the frugal DYI approach makes them both cost effective and alternative to consumer culture. And there are some more established examples to point to: Brad Listi’s Other People podcast or the online literary community The Rumpus, which includes two different book clubs. Of course, others too. I’m not privy to what these endeavors do commercially, but their ability to coalesce communities of writers can be easily seen and joined. By engaging in these, one can be “in company” with other literary artists. With the developments presented by e-books, the changing perception of self-publishing, the rise of hybrid publishing and ability for more people to engage in small press publishing, the opportunities for arts entrepreneurship for writers has never, perhaps, been greater. The work is hard, but it’s there to be done. And I’m not sure we’ve even begun to see and understand all the ways new technologies will manifest opportunities for literary artists. It’s all scary, as change can be, but also exciting. My interests, above all others, is to invest in the building of community. I’ve figured out the ways in which to earn (eek out?) my living, and so my passion resides in finding ways to connect. Because if social media has taught us anything, it’s that we yearn for connection. Bringing people together through the arts seems to me one of the best ways for that yearning towards connection to become the catalyst for community. If it weren’t for that top 10% LinkedIn email, I might never have thought about DYI Arts Entrepreneurship. But, thankfully I have. And perhaps some of you reading this will get the germ of your own idea, expanding and growing the ideas behind the proliferation of literary or other art. Because if the world is full of art and artistic community, it’s also full of possibility. As an English Literature major, I’ve studied Hemingway, Nabokov, Bronte, Chaucer, Shakespeare…and the list goes on. There’s something all of these writers have in common: they aren’t living. Their voices are frozen in the past. Can you think of any living authors that you love to read? There was a time when I couldn’t list many. On the Superstition Review intern application, our editor Patricia Murphy asks for three of your favorite living authors. When I saw that I thought, “Living? Why? All the good ones are dead!” Looking back, I can’t believe all of the authors I was missing out on reading. If you browse through the contemporary authors in Superstition Review’s Goodreads bookshelves, you’ll see these authors are writing lots of books and they are all a part of a thriving literary community. If only we would put down Faulkner, Fitzgerald, or Frost, pick up one of their books, and join the conversation. When I began to use Goodreads, the social networking site for readers, I found that Margaret Atwood, along with some of my other favorite authors, has an account there as well. Contemporary authors are not only writing books: they’re tweeting, collaborating with a publisher on a Q & A session, or speaking to college students. Simon J. Ortiz is speaking to my Literature of Immigration and Diaspora class this semester. Michael Ondaatje came to ASU’s Tempe campus to hold a public discussion. Margaret Atwood is an activist of environmental preservation in Canada, and she uses Twitter and Goodreads to connect with her fans and promote environmental awareness. Alice Munro is the literary voice of the Canadian middle class – she is referred to as “the Canadian Chekhov” – and her new collection of stories was just published. Dickens or Dickinson can’t fulfill that kind of presence. When I joined Twitter, I was delighted by the presence of authors, literary magazines, and book presses. It was like browsing through a virtual bookstore: I followed Margaret Atwood, Joyce Carol Oates, Michael Ondaatje, Salman Rushdie, Anne Lamott, Sherman Alexie, Roxane Gay…and that’s just the writers. Almost every university literary review is on Twitter, plus Tin House, Willow Springs, McSweeney’s, and The Paris Review. I followed The Penguin Press, Red Hen Press, Random House, and Graywolf Press. Authors, magazines, and presses are tweeting like they aren’t worried about censoring themselves or fulfilling an image of distant formality. They talk; their followers talk back. 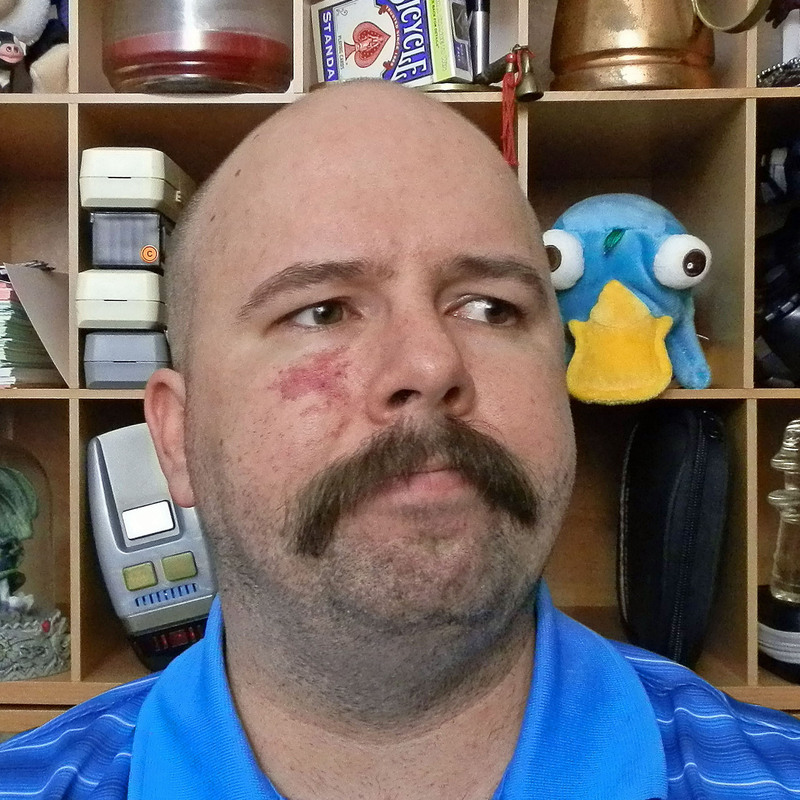 Every time the little blue mark pops up on the bottom of my Twitter feed, it means I have connected with someone. One time, that blue mark appeared because Margaret Atwood had retweeted my tweet. It was incredible – an accomplished, famous writer who has over 300,000 Twitter followers took the time to retweet my tweet. I took a screenshot of my tweet on her profile, uploaded it to Instagram, and updated my Facebook status (it read: One of my tweets was retweeted by Margaret Atwood, one of my favorite authors. No big deal…just kidding, it is!). In my 15 minutes of Twitter fame (at least, it felt like fame to be on Margaret Atwood’s profile for, literally, 15 minutes before I was lost in her sea of tweets) I experienced how literary culture powered by social media makes writers and literary organizations accessible. One of my projects this semester was to add to our SR Goodreads bookshelves all of the books by SR Contributors from all of our nine issues. I created bookshelves that hold fiction, nonfiction, and poetry written by Superstition Review contributors. With nine issues of Superstition Review released to date, the number of books quickly rose to well over 1,000. I became better acquainted with so many contemporary authors. Some Superstition Review contributors have a vast list of published works, such as Sherman Alexie, T.C. Boyle, Adrian C. Louis, and Madison Smartt Bell. Other contributors have a smaller list of works on Goodreads, but their readership is growing as they use Goodreads and other social networking sites to create an online presence. The SR Goodreads account is a great way to follow their careers. 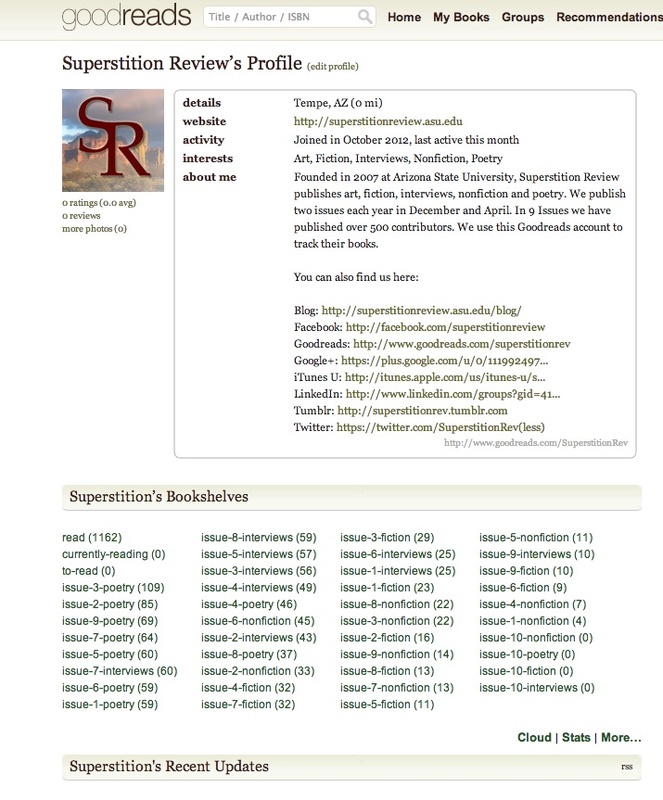 As I worked on a Goodreads project for Superstition Review, I noticed that literary magazines and presses are also using Goodreads, like other social networking sites, to extend their online presence. Goodreads’ target audience is passionate readers, so the site can be used to showcase works that magazines and presses have published while making connections with readers and other literary organizations. Willow Springs and Featherproof Books have bookshelves titled “we published it,” The Paris Review has their blog connected to their Goodreads account, and Superstition Review includes all of their various social networking links on their Goodreads profile. The Goodreads literary community shares the goal of extending readership of their magazine, blog, and the authors they have published, while increasing traffic to their other social networking sites. With the emergence of Goodreads, the options for following and connecting with authors, literary magazines, and presses is vast. Facebook, Twitter, Blogs, and Goodreads are all channels of communication within the literary community: which do you prefer and how do you use them? SR conducted this interview with Issue 9 contributor Duncan Hill. Superstition Review: Please give some examples of your past projects and published pieces. Where were they published and when were they published? 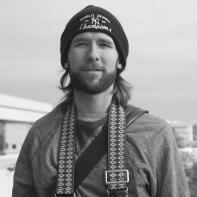 Duncan Hill: Based in Washington, DC, many of my projects focus on activism and multiculturalism in the city. I have recently had photos from my project “A Capital City” published in F8 Magazine, and Photography Monthly, and scheduled for publication in SB Quarterly. SR: How have you grown as an artist? If you could give your past self any advice what would it be? DH: Over the last few years I have learned so much about the photography and arts industries. One of the most important traits I have learned as a photographer is perseverance. The art/photography world can be a rough place, and if you give up the first time your work is denied, or criticized, you won’t make it far. If I could go back in time and give myself advice, I would tell 16-year-old me to start exploring the photography of Garry Winogrand and Henri Cartier-Bresson. Their photographs have had a great impact on my work and I wish I would have been familiar with them at a younger age. SR: How did you first get involved in your field? What sort of challenges have you faced? What do you believe have been your greatest achievements? DH: My interest in photography started as a kid, my father was an avid photographer and gave me a 35mm SLR when I was in middle school. I went to the University of North Carolina at Wilmington for Film, and minored in Digital Arts. Throughout my college career I studied cinematography as well as still photography. A challenge for me has been my shyness. In today’s world of social media, you have to be comfortable promoting yourself. My two greatest/favorite achievements would be: Being named a finalist in the “Under 30” category of Black + White Photography Magazine’s, “Black + White Photographer of the Year” awards; and being awarded “Best in Show” in UNCW’s 2009 Student Art Show and having my winning photo “Metro” added to the school’s permanent art collection. SR: Have you ever tried to work in other creative areas (e.g., publishing, illustrating, etc.)? DH: My father is a painter, and my mother is a librarian and avid reader. So I was influenced by both visual and literary arts growing up. I have written extensively about cinematography and other film topics in the past. I also enjoy drawing and painting occasionally. I am hoping to publish a book of my “A Capital City” series sometime in the near future. SR: Please give us some background biographical information. SR: What awards or recognition have you received for past or present work? SR: What inspired you to create your piece for Issue 9 of Superstition Review? Why did you choose our publication for your submission? How would you describe your Issue 9 contribution? DH: Although much of my work is documentary in nature, I always aim to capture interesting scenes of lines and light. My four images for Issue 9 are studies of converging lines and visually pleasing geometry. I chose to submit to Superstition Review because I was impressed by past issues and I liked the viewer friendly website. Also, I liked the fact that Superstition Review promotes itself well and is involved in social media outlets. Read more about Duncan Hill’s work at his website. Each week we feature one of our many talented interns here at Superstition Review. Scott Blair worked as an Art Editor for Superstition Review in the fall of 2010 and enjoyed it so much that he came back for a second semester. Now stepping into the role of Content Coordinator, Scott’s gaining a different perspective on all the work that goes into creating and marketing such an impressive journal. Scott shies away from social media, going as far as to proudly point to his four-year-old Twitter account that has never sent a tweet. At 30 years old, Scott remembers chartrooms at 28k, how Gmail addresses used to be by invitation only, and when MySpace pages only had plain white backgrounds. He doesn’t consider himself a technophobe, but finds TVs that report your usage and cell phone apps that tag your location to be a bit disturbing. This semester Scott will graduate with a writing focused degree in English from ASU. Come fall, he’ll be back on campus working toward his Master’s in Secondary Education. By the time he graduates again, Scott should be highly qualified by Arizona standards to teach Biology, English, and General Science. Every once and a while, Scott thinks about taking the three classes he’d need to be qualified to teach choir as well, but three specialties seems to be enough. His ideal career would be in the English department of a public school but because the Sciences are in demand and English teachers less so, he expects to work in biology until a spot opens. 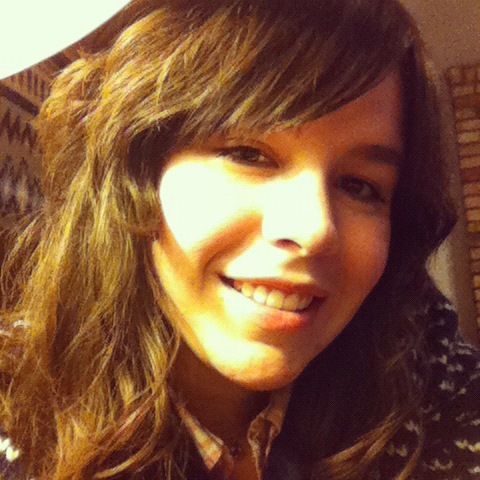 Winona Manrique, Social Networking intern at Superstition Review, is a graduating senior at ASU. Having worked on Issue 8 of Superstition Review as Content Coordinator, she came on board for a second semester with the magazine to learn even more about the process of publishing. Winona writes fiction as a hobby, which is how she first came to be interested in the publishing world. She has participated in NaNoWriMo four times in the last two years (twice in summer) with a 50% success rate. The writing community in the East Valley has allowed her tremendous opportunities both as a writer and a reader. She won the Glendon and Kathryn Swarthout Award for fiction with her first ever short story. Born in New England, Winona has moved more times than she cares to count. She studied abroad in England and fell in love with Stonehenge, Beowulf, and Lewis Carroll’s Alice in Wonderland. She is currently applying to postgraduate programs in the United Kingdom to study Medieval History, something her English Literature major has allowed her a unique opportunity to specialize in. 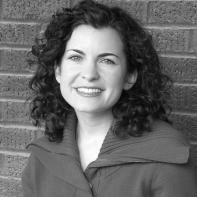 Superstition Review featured Claire McQuerry’s poetry in Issue 2. I recently had the good fortune to discuss her soon to be published collection of poetry entitled Lacemakers. 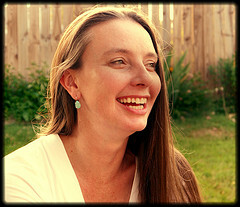 Claire earned her MFA in writing poetry and taught for several years at Arizona State University. Her work has been published in Double Change, Comstock Review and elsewhere. Her poetry collection Lacemakers will be published in December 2011 as the winner of the 2010 Crab Orchard Series in Poetry First Book Award. Superstition Review: How has your life changed since your time teaching at Arizona State University? Claire McQuerry: I took a year off from teaching and worked as a freelance writer, which was enough time for me to realize that I’m much more at home in the academic environment than most other workplaces. I love teaching, and I love being surrounded by colleagues who care about literature and learning. So I’m back in school now, working on a PhD at the University of Missouri, where I’m also teaching and working as the Contest Editor at the Missouri Review. SR: What experiences have you taken away from your work at The Missouri Review? CM: I’ve never been very good with technology and social medias, but part of my job as Contest Editor involves networking to publicize our annual Editor’s Prize competition—so I’ve been learning to use Twitter and to keep up with regular blog posts and follow other journals and literary news online. The move that many journals are making to digital formats, the growing digital book trend, the widespread use of Twitter, etc. are changes I’ve been resistant for a long time, but it seems that that’s the direction things are headed—even in the literary world, which is so slow to change—so I think it’s good that I’m getting to know the online publishing environment better. SR: How is working with The Missouri Review different from other writing you’ve done? CM: I guess I touched on that a bit in the previous question. There’s a level of self-consciousness I’ve had to overcome when I blog or “tweet” for TMR because I’m aware of the very public and immediate nature of that writing. When I write poetry or essays for publication, part of that process always involves honing each piece through numerous revisions until I’m satisfied that the rough edges have been smoothed away, that the work that remains is well-reflected-upon and carefully crafted. This usually requires me to put a draft away for a while and then revisit it after some time has elapsed. Clearly, this level of reflection isn’t possible with online communication, so I’m adapting to a new form. SR: Besides your work at The Missouri Review, what are you currently working on? CM: Teaching and finishing coursework for my degree. Writing more poems when I can. SR: For those who are not familiar with your newly published book, how would you describe Lacemakers? CM: I wrote most of the poems for Lacemakers while living in Phoenix, so a good portion of the book questions the effect a city has on the people who live in it: the poems explore questions of relationship, of loss and longing, and of environment—particularly the man-made environment and its impact on the people who inhabit it. Lacemakers also returns obsessively to separations, which is something I became keenly aware of while living in Phoenix—the way people can live side-by-side and yet remain incredibly isolated. SR: When did you begin writing Lacemakers, and when was it completed? CM: I wrote the oldest poem in the collection in 2002, and the most recent poem was written about a year ago, so I guess that covers a span of seven years. The early poems have undergone so many revisions that they don’t look much like their first versions. SR: What advice would you offer to an aspiring writer? CM: Well, it may sound obvious, but it’s the best advice I got from my mentors when I first started writing, and it’s still the best I can offer anyone else: read. Read widely and often—both authors who have a similar style to your own as well as those who challenge you or have a different aesthetic. A poem (or an essay or story) is always a response. You’ll find that your poems are richer and your mind is fuller of the poems you want to write if you feed yourself a steady diet of other writers’ work. I only wish that I hadn’t waited so long in life to listen to this advice myself!